Nena takes a deep breathe while pulling out her lucky flail with a weapon-summoning scroll. "I'm ready for you, Roy-dono." Roy blinks, "I...adore your title for the message. Nice one." She says, grinning a bit and taking out her katana. "Make the first move...I never do~"
She nods and swings her flail around to gain momentum until it's fast enough so as the ball cannot be seen. She runs at Roy and makes a sharp turn to Roy's left while aiming the swinging the ball on a chain at Roy's legs so that either the ball would meet flesh or the chain would wrap itself around her legs. Roy grins and quickly jumps up into the air, just as the chain is about to wrap around her. She smashes her katana into the ground, causing the chain to wrap around that and she lists her katana out of the ground and tugs on it. "Got ya." Nena holds a tight grip on the handle while she is being pulled towards Roy, noting her Katana and the chain are still connected. When she is close she throws multiple shuriken at Roy with one hand since she is at close-range while tugging on the handle of the flail to pull the katana out of Roy's hands. Roy grins and doesn't let the katana go, tightening her grip. She flinches a bit as the shuriken hit her and pulls out a few kunais with explosive tags on them. "Wanna...test your luck?" She asks, grinning a sadistic grin and tilting her head to an awkward angle. Nena doesn't let the sadistic grin intimidate as much as it could. "Wanna test yours?" She shoots back while making a hand sign. "Mind Style: Sight Distortion Jutsu!" She shouted. Normally, the chakra would have to travel from Nena to Roy from eye-contact and --in special cases-- touch. Seeing as Roy decided to keep hold of her Katana, which had Nena's flail wrapped around it, that was a good enough guide for her chakra to travel safely from herself to Roy without the normal complications of touch and eyesight. Roy's sadistic grin stays plastered to her face, "And...do you really think that it's going to effect me...?" She says, gripping her katana tightly. "Well then, if you can still see me, I truly am. But I had to test my luck or else you'd have attacked me. I've already gotten you with shuriken, although only a little, getting this close wasn't that much of a risk for me because if you throw those explosive tags at me though, you get hit as well from this close range with our little tug-of-war going on." She pulls out kunai with her free hand and proceeds to throw them at Roy's katana-wielding hand and even arm while tugging harder. "So let's press your luck this time." Roy's grin widens, "...Good job with testing your luck~" She says, throwing the explosive tags, letting the kunai hit her arm, though it seemed to have no effect. Tilting her head a bit, she smirked, "Bye bye~"
"Crap babies!" Nena shouted while tossing the flail aside so that she could [barely] dodge the explosive tags. The explosion impact caused her to mildly fall off balance so she jumped back, causing distance between her and Roy. "Fine . . . you obviously won't drop your weapon." She murmered while summoning duo sai knives into each of her hands. Roy kept her creepy little pedo grin and waited. "...London bridge is falling down....falling down...falling down!~" She chanted in an...odd voice. Nena stayed where she was, not just because the grin creeped her out, but because she wanted to seem cautious towards the possible implication the aweomse eerie song had. "Are you fighting me for real, or are you hiding behind your puppet, Roy?" She asked while wondering if her lack of movements from before were from laziness or limited movement. She held one Sai knife in front of her and the other behind her in a deffensive position. "It's good to know if my opponent is a cheap piece of wood or not." She said with a smirk. Roy kept the grin, "Who knows....you'll find out the second you cut me..." She said, holding her katana in front of her, waiting. Nena shrugged and placed one of the sai-knives between her teeth while pulling a kunai out. She preformed a shadow-clone jutsu where as a hord of clones were summoned. The clones encircled Roy and proceeded to run at her while throwing kunai at her. Their sai-weilding hands were making swipe motions aiming to cut her just as she requested. Roy closed her eyes, her face relaxing and her body going a bit limp. "...Gimme your best shot..." She said, opening her eyes and smirking. The clones dissapeared in a thick cloud of smoke and Nena jumped through that smoke making hand-signs and then putting her hands out. "Fire Style: Pheonix Flower Jutsu!" She shouted which caused multiple flaming shuriken to fly at what was hopefully Roy. Hope Sasuke doesn't mind me borrowing his swag for a moment . . .
Roy froze, hearing her "Ducky's" attack. "...Wh-" She flinched a bit as a few of the shuriken hit her, though after that, she seemed uneffected. 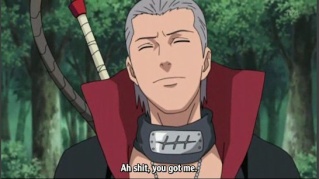 "...How could you use his jutsu...?" Roy asks, walking out from behind a tree. "...Meh..."
Cooky, who has been watching and analysing quitely like a good little girl, immediately bursts into laughter at Roy's horror, rolling on the grass while clutching and stomach and positively howling. Nena tilted her head to in curiousity to Roy. "Dammit!" She thought whil turning to Roy. "Sometimes when I enter people's memories, I experience something of theirs while trying to distort a completely other memory. It's rare, I'll tell you that much. But that's all I'll say on the subjct." 'Crap! Long-ranged!' She says while jumping back and dodging the fire. Her upper arm is momentarily licked by flames causing her to flinch while trying to dodge any more flames. She starts running at Odo while getting brushed by a flames as she nears with her Sai-knives in hand she holds one out to attack the puppet and one out to swish away any flames that come head on as she nears the puppet. Roy grins and throws a few kunai and shuriken at Nena, smirking. "Don't you dare touch Odo...I'll kill you~" She says, grinning. Nena grins as she comes to a stop to use her sai-knives to dodge some of the shuriken while others graze her skin. A shuriken made an entrance in her right arm but she managed to pull it out while thanking her genes that she was not a bleeder. "That's alright, I won't touch him. I'm close enough, anyway." She said while preforming hand-signs after placing the sai-knives in a holster and turned to odo with her finger to her lips. "Just because fire-styles seem to get to you . . . Fire-Style: Fireball Jutsu!" She shouted while an inferno rolled out from her lips and towards Odo. Roy narrowed her eyes and glared, twitching her fingers. "...Don't even start on me..." She said as Odo lifted up his hands once again, this time sending water shooting out to counter the fire. In the smoke that followed, Kouhi had finished her beating up of the Vice President and was right behind Nena, kunai pressed against her back.